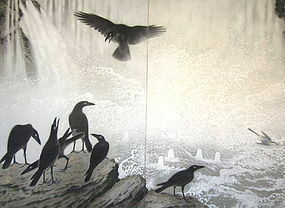 Wonderful Japanese antique two panel byobu screen painting in ink and mineral colors on silk, Nihonga School, depicting a scene of a group of seven crows and a single magpie near a waterfall and hot springs possibly Onsen Baths, beautifully painted churning water and falls, signed and with hanga of artist Aizu Katsumi: born Fukushima Prefecture. 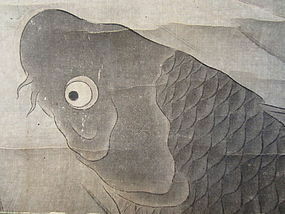 Exhibited Teiten and Bunten Exhibitions during prewar period. An antique Japanese cosmetic box decorated with a tataki-nuri style black background with makie of vines and gourd and folding fans on the exterior. The interior is decorated in nashiji with a still life of a flower arrangement set in a basket with a rabbit and autumn grass for the inner tray. 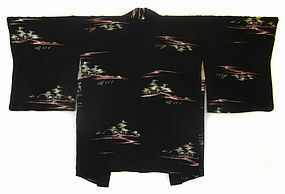 The vibrant colors and designs are often seen in lacquer works from the Edo and Meiji periods. 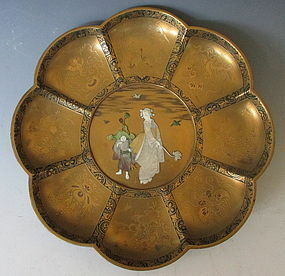 Age: Meiji Period c1880 Size: length 9.5" width 7.75" height 6"
Eight lobed inlayed Japanese lacquered dish. Each lobe is decorated in makie, the flora and fauna of the four seasons with archaic designs set in between. The central area of the dish is depicting a female figure holding a lotus with a child attendant holding a bouquet of lotuses. 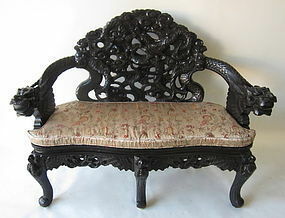 The bottom is crafted in the nashiji style with a signature set in a medallion motif reading: Kaneko Zo, or Produced by Kaneko. 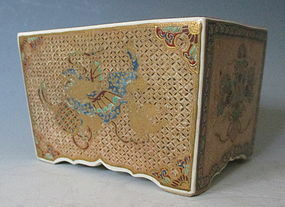 Age: Meiji Period Size: Diameter 8.25" Height 1.5"
A splendid and refined Satsuma rectangular incense censer. Each painted panel is minutely painted with traditional motifs with images of a phoenix and Shi Shi Lion in raised detail. 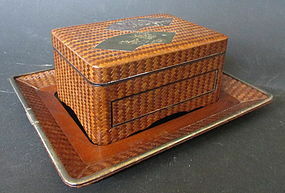 The bottom of the container contains a signature which reads, Dai Nippon Tokyo, Matsuura Yuzan Zo. 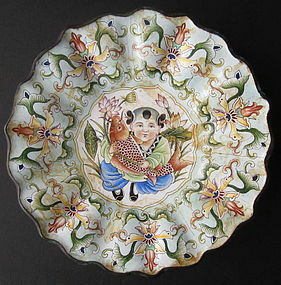 Lovely condition Age: Meiji Period Size: length 3.5" width 2.75" height 2.15"
Charming Chinese antique cast iron and enamel plate painted with a little boy holding a large fish and lotus flowers in his arms, scalloped rim decorated with flowers, the bottom is enameled white with blue and red characters around the rim, blue enamel four character mark on bottom, early 20th century Republic Period. Size: 6 3/4" wide x 1" high. 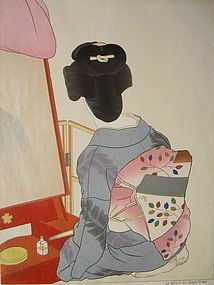 Paul Jacoulet print, "Le Miroir de Laque Rouge, Tokyo"